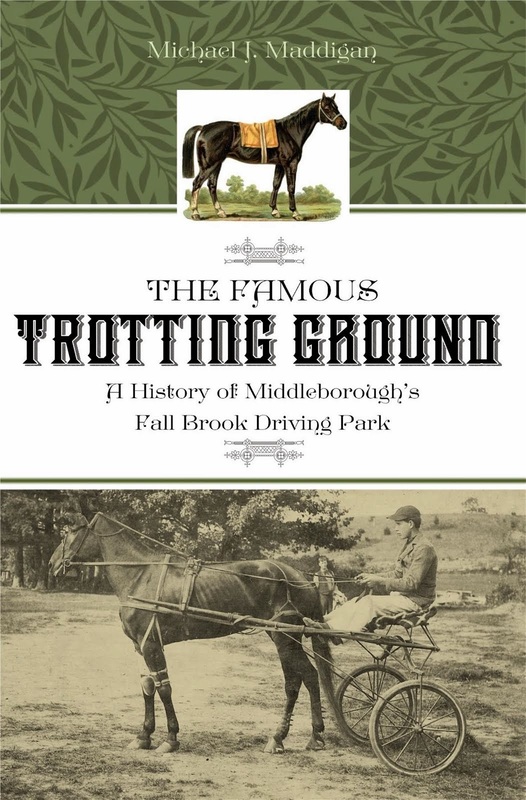 The development of local commercial dairying as both an industry and a way of life for farmers dates back only 125 years, when Middleborough and Lakeville were relative latecomers to the industry. Helping foster the development of the early local dairy industry in the 1870s and 1880s was the cooperative movement which played a key role in establishing a relatively stable economic basis for the industry, as well as higher standards for the production and retailing of raw fluid milk. Until the 1870s, milk produced by local farmers was intended for their own personal consumption or for sale in the small local market. In 1876, however, due to advances in the shipping of milk, Middleborough and Lakeville farmers began "exporting" raw fluid milk to Boston, and by January, 1877, they were shipping 800 quarts daily into the Boston market, sealed in 8 quart cans. Middleborough at this time had 727 cows (the most of any town in Plymouth County), and Lakeville had 310. Herds however remained small, dispersed among numerous farmers. From the start, fluctuating prices proved the nemesis of early local commercial dairymen. 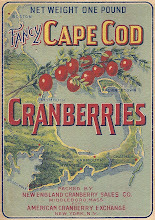 Though Middleborough and Lakeville producers were realizing 24 cents for each 8 quart can in the latter half of the 1870s, a subsequent steep drop in prices brought about speculation that local dairymen would withdraw their milk from the market and form a local co-operative devoted to the manufacture of cheese. The first American cooperatives for the production of cheese had emerged in the mid-19th century and drew upon the Northern European tradition of combining agricultural resources. 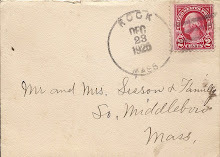 And though nothing came of the "cheese factory" proposal in Middleborough, local dairymen did establish the Middleboro and Lakeville Milk Association around this time as one of the first producer co-operatives of whole milk in New England, and possibly the first such cooperative in Massachusetts. The purpose of the cooperative was multi-fold. Though intended primarily to help local farmers secure the best price for their product in the Boston market, cooperative retail distribution of milk by Middleborough and Lakeville farmers entailed improvements in the standards of the milk retailed since better quality milk was more likely of securing a guaranteed market. Consequently, relatively strict standards governing the producers' milk were enforced. 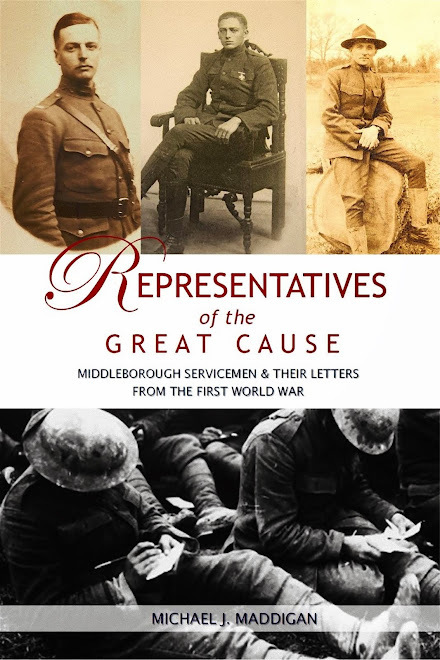 In its role as a counterwieght to the influential Boston milk dealers, the Middleboro and Lakeville Milk Association enjoyed some early success helping local dairymen obtain a fair price for their product and consequently a secure financial footing for their industry. In September, 1880, the Association announced that it had brought in some $8,000 in receipts during the foregoing year to be shared among its members. Local dairy output was undoubtedly stimulated by the increased prices the cooperative secured. 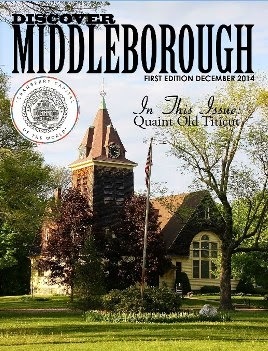 During this period, East Middleborough would emerge as a noted local dairying center, shipping its output directly to market in Boston. In December, 1880, the East Midleborough producers sent some 1,000 cans to the Hub. By the following June, the monthly shipment had increased to 1,277 cans. The subsequent year saw another increase in the local consumer price of milk to 6 cents in the late summer of 1881. The Middleboro Gazette regarded the increase strictly from the point of view of local consumers when it criticized the price hike, not fully recognizing that the prices were responsible in helping dairying become a viable occupation through which farmers could now earn a living. And though 6 cents appeared exorbinant by the standards of the Gazette, the newspaper had no right to complain about the high price of milk, according to the Plymouth Old Colony Memorial, as milk prices in Plymouth seldom, if ever, went as low as 6 cents. Despite the frequent uncertainty of milk prices, local producers continued to increase the flow of local raw milk into Boston. 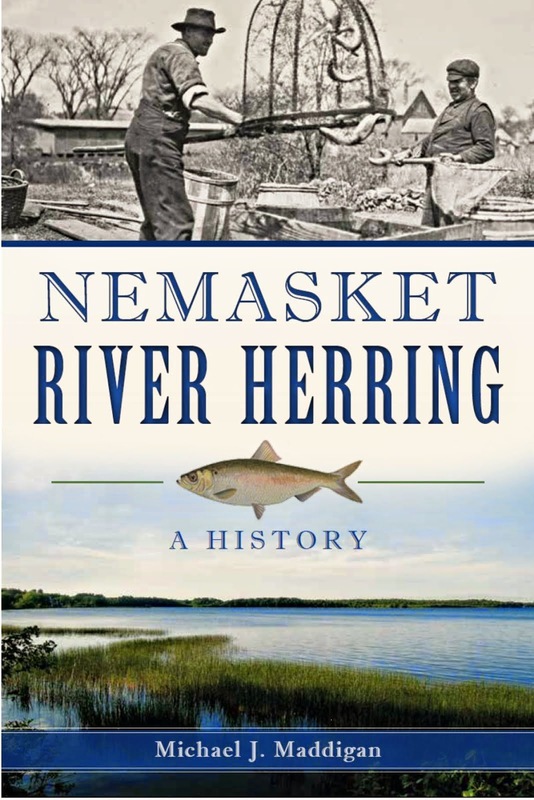 For the year ending October, 1881, the Middleboro and Lakeville Milk Association shipped 10,500 more cans to the city than it had the previous year, at a price of 20 cents a can. Though the price achieved by farmers in 1881 was lower than in earlier years (no doubt due to the rapidly expanding supply), the Gazette, again, in June, 1882, criticized what it regarded as the high price of milk. At least this time, the newspaper seemed cognizant that the increased price was a product of the increased cost of feed which confronted local dairymen, and hardly represented profit on their part. The Gazette did, however, snipe at dairymen who deliberately failed to give customers their full measure of milk on the somewhat dubious grounds that it was too dark to see properly during their early morning rounds. Dairymen, "should, at least, while maintaining winter prices, give full measure, as the mornings are light now, and there can no longer be any excuse for being unable to see in dealing it out." This last matter had long been a complaint of dairy farmers in general. Short measures and adulteration (typically through the addition of water in order to increase the amount of milk to be sold), were the most frequent criticisms of dairymen. And while certainly these practices were engaged in by very few dairymen, the actions of these dishonest men raised consumer skepticism regarding the quality of the milk they were purchasing. Both the cooperative and the state were aware of this situation. Accordingly, the local association placed stringent controls upon local milk production. Local dairymen found watering their milk were fined the then enormous sum of $50. As a result, Middleborough and Lakeville milk enjoyed a reputation of being free from tampering and consequently acquired a solid share of the competitive Boston milk market which was expanding rapidly as new residents flocked into the city. During the mid-1880s, the Old Colony Milk Producers Association, successor to the Middleboro and Lakeville Milk Association, continued to foster the growth of local dairying. The Milk Producers Association, for the year ending October 1, 1883, shipped some 38,361 cans of milk to Boston, for a receipt of $10,639.07 to be divided among its members. 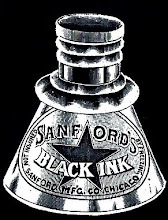 The Association was successful at times of achieving a reasonably high price for its product in the Boston market. In January, 1885, its members realized a price of 30 cents a can. It is likely that most of Middleborough's commercial dairymen were producing for the Boston market. 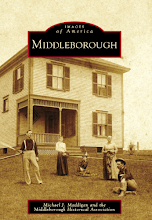 The 1884 business directory for Middleborough lists only four individuals dealing milk locally. The successful rooting of local commercial dairying during its first decade, and its subsequent expansion over the ensuing decades, was largely due to the fact that commercial dairying represented an improved and more secure livlihood, and a better way of life for those engaged in it. This, in turn, was largely due to the role of the local producers' cooperatives during the first ten years of commercial dairying. And despite a somewhat checkered record at obtaining consistent prices for its members, the local cooperatives were generally able to sell their members' output at reasonable and livable prices. Even when the price realized by local dairymen fell to 20 cents a can, it was still "reported as a gain to this class of citizens even at these prices." Thus encouraged by both a secure share in an expanding market, and reasonably secure prices, local dairymen set about increasing their output by expanding the size of their herds, and by concentrating upon breeds such as Holsteins and Ayrshires best known for the quantity, rather than the quality, of their output. 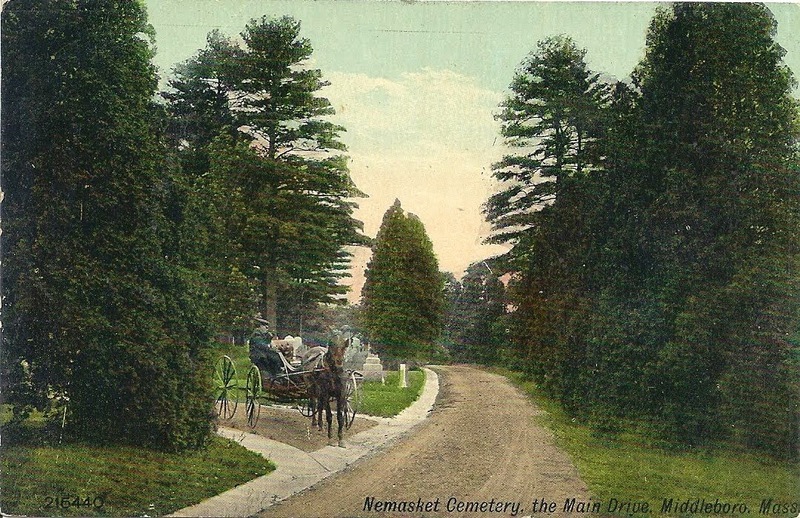 The success of these early dairy cooperatives, however, was relatively short-lived, and those in Middleborough and Lakeville undoubtedly suffered the same fate as cooperatives elsewhere. The milk retailers to which the cooperatives sold began to reassert control over the market and accordingly the prices which were realized. Additionally, the control of milk prices which cooperatives were seen to have was regarded as monopolistic by some and they came under the scrutiny of the Sherman Anti-Trust Act (1890). Middleborough dairymen would subsequently begin selling to more local dairies following the turn of the century including Fickert's and Kinsman's. It was through the initiative of these early dairymen, however, and the producers' cooperatives they formed, that the foundation of local commercial dairying as a significant agricultural industry, and as an important and better way of life for farmers was firmly established. 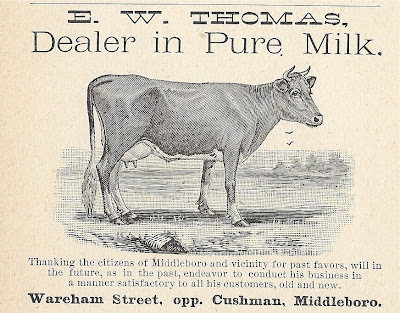 E. W. Thomas advertisement, Resident and Business Directory of Middleboro', Mass. 1889. Eliphalet W. Thomas, was a Rock Village farmer and dairyman who produced milk for the home market. Though the engraving depicts a contented-looking Jersey cow, the breeds of choice for local dairymen producing for the lucrative Boston market remained the sturdy Ayrshire and the familiar white and black-spotted Holstein-Freisian. Thomas' farm was later occupied by J. Herbert Alexander's Dahliatown.